New ZoomRadar Storm Chaser App for IOS & Android!!! Download our brand new FREE mobile app with dozens of live streams on severe weather days. 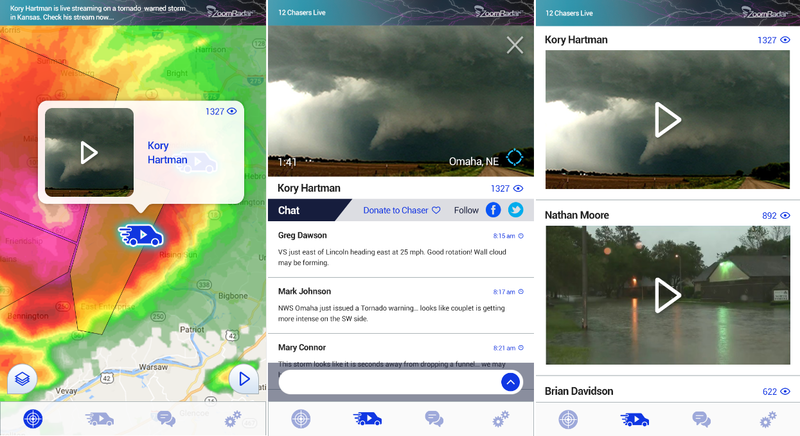 Features radar, severe warnings, storm chaser positions, storm chaser streams accessible through both the map and chaser list, group chaser chat, notifications when chasers are streaming big time storms, ability to donate to individual chasers etc… The app is free to download and also has an in-app purchase that helps victims of storm damage. This app is in partnership with SevereStudios Storm Chasers. Is your website looking for interactive radar to insert into your mobile app? Features available include: Hi Res Radar, Severe Warnings, Live Video Storm Chasers, Storm Tracks with Time of Arrival, Storm Reports, Temperatures & Winds. White label with your logo also available.